My parents and I once met up with a family that was camping with llamas and it was one of my most memorable backpacking experiences. A trailer wasn't even required; they opened up the back door of their van and the llamas knelt placidly on the floor. I hear that folks are also starting to use goats as pack animals; Saanens are thought to be particularly good for this purpose. IT was a sublime moment. Deep in the woods, the fire had burned down to glowing coals. Our sticky-faced children munched contentedly on perfect s’mores, the marshmallows uniformly toasted and gooey. Pine cones popped in the fire. And nearby, the llamas grazed quietly in the bushes.We were in Colorado’s backcountry, our tent pitched in a stand of Engelmann spruce next to a burbling creek. Our large heap of gear included the rotating and telescoping metal roasting sticks we’d just been using. Ordinarily, we would have scavenged and whittled sticks — if we’d packed marshmallows at all. 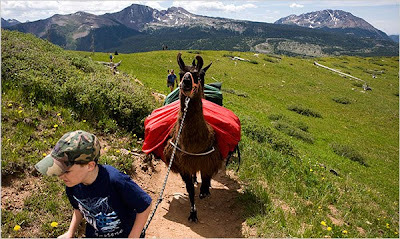 But we were llama trekking, with furry 325-pound porters to carry our load. So why not? I have heard there are outfitters in the Olympics and Cascades who also use goats, though that seems a little less romantic. (Goats are cute though).